The Mythos Academy series is one of my favorite Young Adult book series. The characters have all become a part of my book family and I look forward to each new book. However, this one seemed to be missing a bit of the magic that the first four books. Gwen is still the same sweet, headstrong heroine that I've come to love, and her friends are still there with her through whatever trouble comes her way, but I don't know if it's because the setting was different or there wasn't as much romance, but this was not my favorite of the series. I felt like the writing has changed and instead of going for the older young adult crowd, it went from the younger section instead. Whenever Gwen would use Vic, her sword there would be adjectives used to describe the sound it made-clang, clang, etc. and when the giant gyphron birds would make a sound, the were also adjectives used to describe it (caw-caw) and I'm not sure why those were used. It bothered me to the point of distraction and that's never a good thing. In almost every series there is a filler book that bridges the beginning story line to a new one, and I think this was it for this series. I just wanted more of well, everything in reading this one. 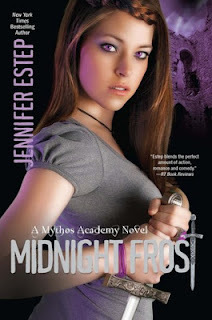 Jennifer Estep has created a wonderful, magical world in the Mythos Academy series and while this one was disappointing, I'm not ready to give up on this series just yet and can't wait to see Gwen finally have some happiness and get those reapers.